It's odd how much the weather impacts our perceptions of a place. The first time I visited Chartres, it was pouring. After admiring Chartres Cathedral's magnificent 12th- and 13th-century stained-glass windows, we quickly toured the city's windblown streets before seeking refuge in a café. Over cups of hot chocolate liberally topped with whipped cream, we surmised that we had seen most of what Chartres had to offer and beat a hasty retreat to Paris. Now, thanks to some blissful, sunny weather and a four-day "Vin et Terroir" tour organized by the Loire Valley Tourist Board, I realized how much I had missed during my initial visit and have added Chartres to my list of favorite weekend destinations. 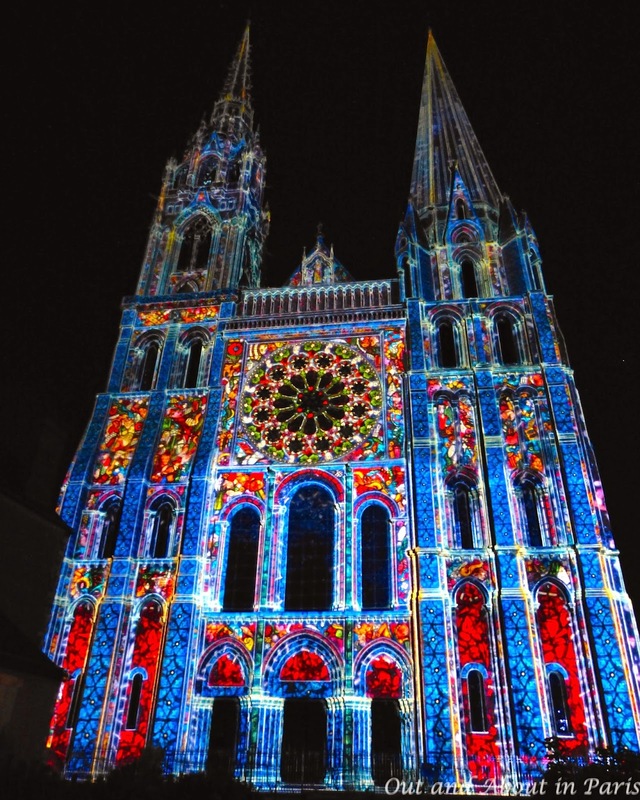 If you travel to Chartres before October 12, be sure to devote at least one evening to the spectacular "Lights of Chartres". From shortly after nightfall until 1 am, the city takes on a festive air as locals, families, friends and tourists follow the light trail leading to 29 illuminated monuments. While it's tempting to begin with the star attraction, I recommend saving the Cathedral for the grande finale of what will surely be an unforgettable evening. 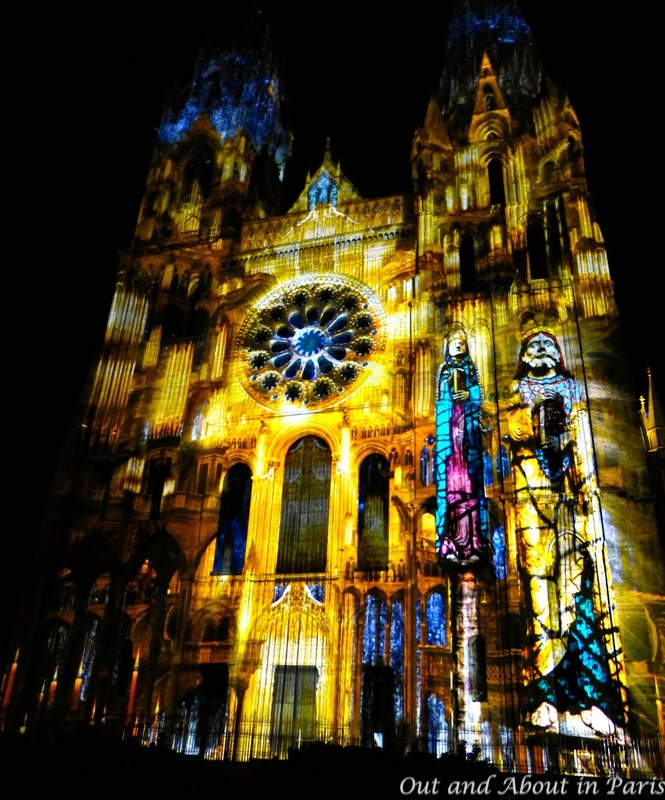 Watching the animated re-enactment of the Cathedral's construction projected on its towering facade, I felt the same sense of awe that people must have felt at their first glimpse of the Cathedral in the 12th century. When the show ended, I burst into spontaneous applause with the rest of the crowd. Even if you've already seen the 12th-century Belle Verrière and 13th-century Rose windows, a trip to Chartres wouldn't be complete without visiting the interior of Chartres Cathedral. The ancient stained-glass windows, which were removed during World War I and II to protect them from bombing, present interesting glimpses of life in medieval times. As the theme of our tour was gastronomy, our guide explained that many of the windows were originally sponsored by various craft and commercial guilds, such as the Bakers' Guild. 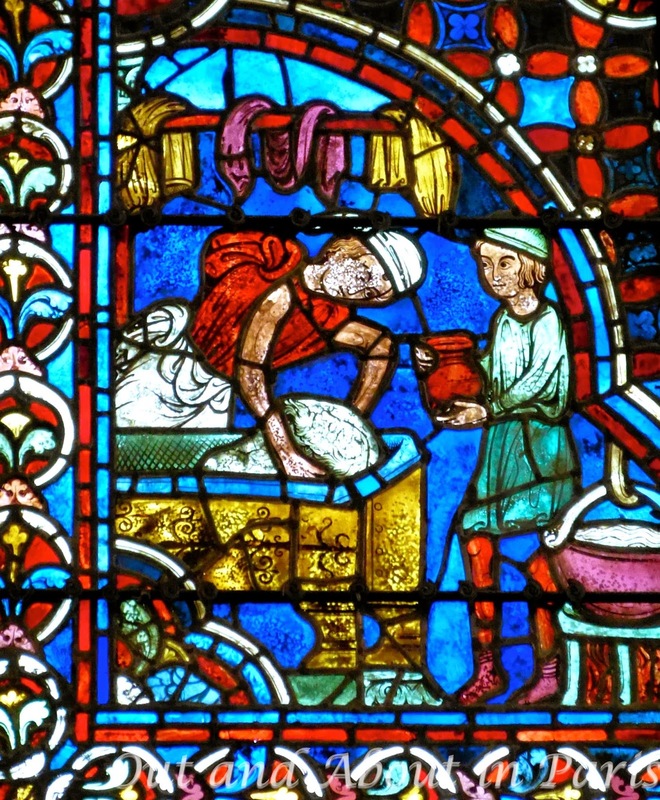 In the lower panels of the Bakers' Window (Bay 140), a baker is seen shaping dough, sliding loaves into hot ovens on long-handled paddles and selling bread to a customer. All of the loaves are shaped like balls, or "boules", which is the etymology of the French words for baker and bakery, boulanger and boulangerie. When you visit the Cathedral, try to spot the stained-glass windows funded by the fishermongers, water carriers, butchers and winemakers. The panels on the lower left-hand side of the windows indicate the trade of the donors. Furriers, weavers, drapers, blacksmiths, wheelwrights, shoemakers, haberdashers and apothecaries are some of the other medieval trades portrayed in these remarkable windows. 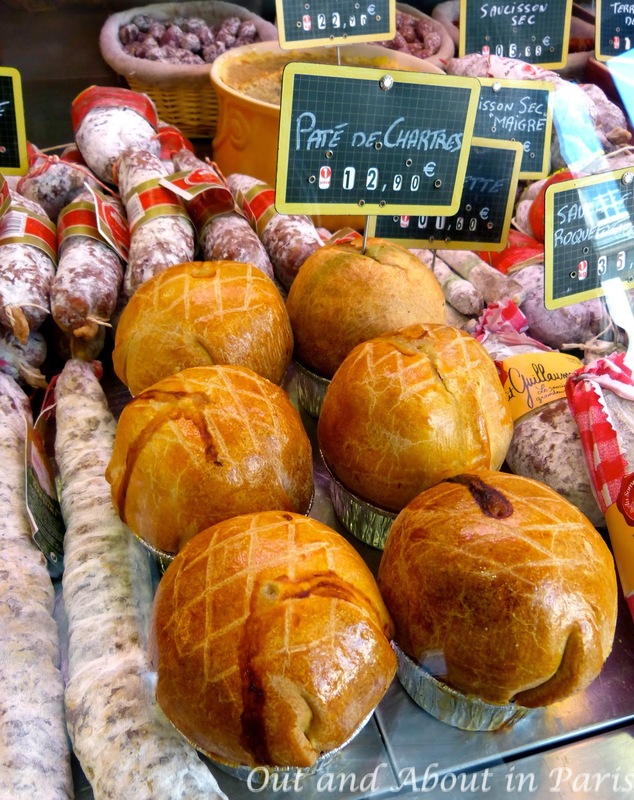 Chartres has numerous local specialities that are worth sampling. Famous since the 18th century, Pâte de Chartres is pâté baked in a crust. It was traditionally made from migratory birds that flew over the city but more recently from young partridges and pheasants. The somewhat difficult to pronounce Mentchikoff is a sweet confection made of fine praline chocolate covered with a light meringue. It was created in honor of the Franco-Russian Alliance in 1893. More recently, artisan chocolatier David Lambert devised a clever way to fuse the cultural and gastronomic history of the city. His Vitrail de Chartres, an ode to both the stained glass windows of the Cathedral and the Mentchikoff, are confections made from praline, dark chocolate and meringue topped with magnificent Chartres blue and gold. It's a must-try for chocolate lovers! In addition to Loire Valley wines, Chartres also has an award-winning, local beer. Found in many of the restaurants and shops, L’Eurélienne is brewed and bottled on a family farm less than six miles from the city. How to get there: Chartres is an easy 50 minute train journey from Paris Montparnasse. Check the SNCF website for up-to-date information on train schedules and ticket prices. Where to stay: Le Grand Monarque is Chartres' premier hotel conveniently located in the historic center. Enhance your stay with a wine tasting hosted by head sommelier Nicolas Duclos in the hotel's cellar, dinner at the Michelin starred restaurant or a relaxing massage in the spa. Where to eat: Both times that I've been in Chartres, I've enjoyed a traditional French lunch at Le Pichet 3. Also recommended by American travel guru Rick Steves, the cozy bistro/local-product shop is a great place to pick up a colorful scarf, souvenir bottle of local beer or a necklace while waiting for your steaming hot poule-au-pot (chicken in a pot) or Boeuf Bourguignon to arrive at your table. More information: To book a guided tour, download the free app "A Day in Chartres" and get the latest news about current events, be sure to visit the Chartres Convention and Visitors' Bureau Official Website. Click here to see the photo album, "Completely Charmed by Chartres"
LOVE this review and post. We really didn't see Chartres at her best, but our lunch at le Pichet 3 was indeed memorable! (and I love the scarf I bought there) I was trying to figure out where to go in Sept and your post here has me convinced to return to visit the city and illuminations. You were in my thoughts while I was visiting sunny Chartres, Nancy! It was so different from when we were there in the pouring rain. I'll try to join you if you go in September. Then, we could finally see La Maison Picassiette. You're always welcome, Bridget! I hope that you'll come for a visit once you finish your Ph.D.
You're planning a May-June 2015 trip? That's wonderful news! By the way, it's the first night of Les Heures Heureuses de Paris and it's pouring. Does that remind you of anything? Gorgeous, I've been to Chartres but I think I just saw the cathedral too. I'd love to see that light show. And you learn something every day re: boule - boulanger! Gwan, We learned all kinds of interesting things from our guide - like the origin of the word bank and the reason why butchers used to wear green clothes, like surgeons do now. You haven't mentioned the canal walk. Chartres is one of my favourite places and the cathedral is just stunning. I haven't seen the sound and light show though. But I do have a cabochon from one of the stained glass windows in my house in Blois! You're right. I should have mentioned the canal walk, Rosemary, but I didn't actually go there this time since the theme of the visit was gastronomy. Any chance that you've written a blog post about the canal walk? If so, I'll add a link to it in my post. Thanks for posting the helpful info about the cathedral and the link for Malcom Miller's tours, Sara! Ever since I heard about Mr. Miller, I've been hoping to do one of his tours. Now that he's 82 (I think), it seems that he's not doing as many as he used to. The woman who was our guide said that she used Malcolm's book as her primary reference when she spent a year studying Chartres Cathedral. I'll have to see if I can schedule a tour with Malcolm or possibly an interview with him the next time I'm in Chartres. Thanks again for the info! Hey, Nancy. Our visit two years ago was pretty soggy. Mary Kay described it perfectly. I was so glad to have been there before on a sunny day. But I didn't make Malcolm's tour which friends had recommended. So another trip is due- in the afternoon or at night. And Rosemary is right- the river walk is gorgeous. Right out of a Merchant Ivory film. Of course that's not what it looked like when we were all there together. Carolyn, I thought that the light show may be of interest when your French friend Anik and her daughter visit you in Paris. It really is spectacular! I had to Google "Merchant Ivory". You're right, the canal didn't look like a Merchant Ivory film when we were there! But still, I'm happy that we braved the weather and walked to the lower part of town. Especially since it gave you the opportunity to see Stéphane's made-to-order umbrella in action!